This blog is dedicated to the proficient defensive use of MGRS maps, the GridScout™ Google-Maps client, and other tools well suited to the goals of GridScout™. A few months ago, Google put the non-profit Gmap4 service out of business. GridScout™ relied on Gmap4 for its aerial views, so that was a sad day. But yesterday I reënabled the aerial-view feature using Google Maps directly. It lacks the MGRS-grid overlay that we used to enjoy with Gmap4, but it’s still useful for confirming the relevance of a search result and checking its surroundings. Google recently changed its API usage policy, effectively putting the non-profit Gmap4 out of business. That’s unfortunate, as Gmap4 was designed to benefit disaster-management organizations and was doing a great deal of good in that realm. Since GridScout™ used Gmap4 for its aerial views, that feature currently won’t work. While this does not affect GridScout’s primary goal of searching Google Maps and performing bulk collection of MGRS location data, it does make it harder to verify the relevance of unfamiliar search results. The maker of Gmap4 has made appeals to Google in hopes of coming to an agreement, but Google refused. In order to continue using the Google Maps API in his volunteer efforts, he’d have to shell out $46,000 per year. 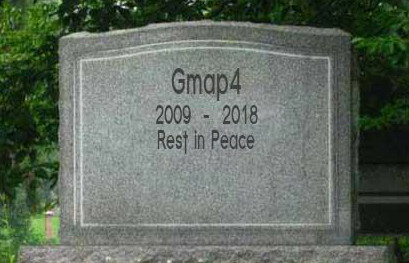 So Gmap4 is now gone. Bummer. I am now considering alternatives to Gmap4, so that I can restore GridScout’s aerial-view feature. Update: I replaced the aerial viewer. The ultimate purpose of the GridScout™ map-search tool is to provide for a better community defense. 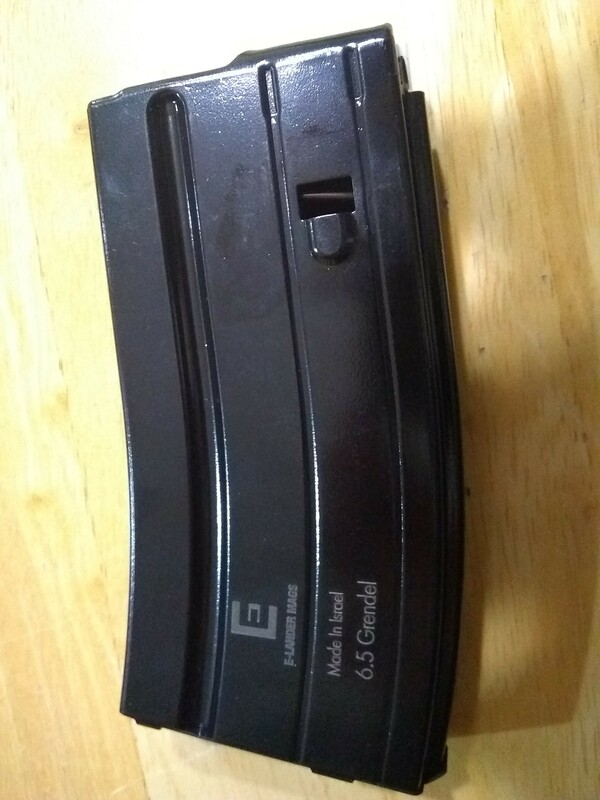 For that same purpose, I’m building a new firearm. I call it the RC1. Why RC1? Because it’s easier to explain that RC1 stands for Reeder Carbine #1 than to explain that PK6 (my original name for the RC1 concept) stands for Piŝta Karabeno je 6,5 Grendel. I think I can more fully achieve my own goals by creating a custom carbine than by selecting any of the off-the-shelf offerings that I’ve already considered. So I’m going for it, and upon completion we’ll see how it performs. The RC1 design is based somewhat on the Alexander™ 6.5 Grendel Incursion, which is relatively light and fires one of the most effective general-purpose cartridges yet devised for modern sporting rifles. The Incursion, however, isn’t everything that I want it to be. It’s slightly longer than I prefer for close-quarters maneuvering. More importantly, it still relies on the direct-impingement gas system that got M16 operators killed in Vietnam. But thanks to the versatility and popularity of Eugene Stoner’s modular AR-15 design —upon which the M16 and the Incursion are based—, we now have a standardized means of interchanging parts to fit the needs and wants of the shooter. The RC1 will take advantage of this in two important ways. Certain part selections, inspired by PDWs and by AR15A3-derived ultralight carbines, will serve to make the RC1 lighter and more maneuverable. The bolt will be cycled by a gas piston, based on the Armalite AR-180 design, which has proven substantially more reliable than direct gas impingement. Piston gas systems consistently outperform direct-impingement systems in reliability tests, as they did in a 2007 test by the U.S.Army. The barrel of the RC1 will be of the standard 16” carbine length, just long enough to avoid the red tape associated with a short-barreled rifle. This length also produces high enough muzzle velocity and bullet energy for practical medium-range use. The muzzle brake will be a short, single-chamber model to minimize the added weight and length. The RC1 will have a very short, fixed-length buttstock to shift its mass closer to the shooter’s body where it’s most easily supported. 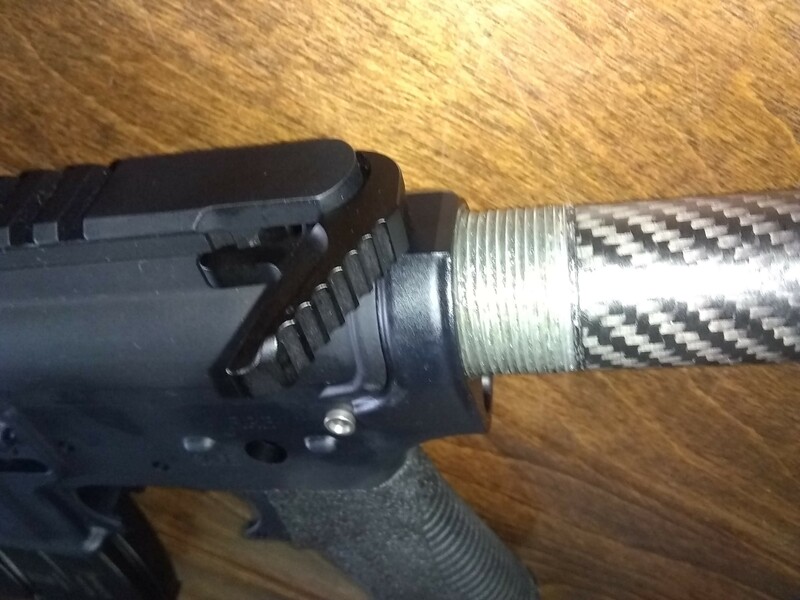 With the 33° grip angle that’s most common in modern carbines, this position would be uncomfortable for the wrist of the shooter’s dominant hand; so the RC1’s grip will instead be nearly vertical as in a PDW. This weapon will be as lightweight as practicable, in order to limit muscle fatigue so the shooter can more easily keep his sights steady on the target. Progress on this project is as follows. Initially, a few paper parts stand in for some of the major parts that I have not yet acquired. 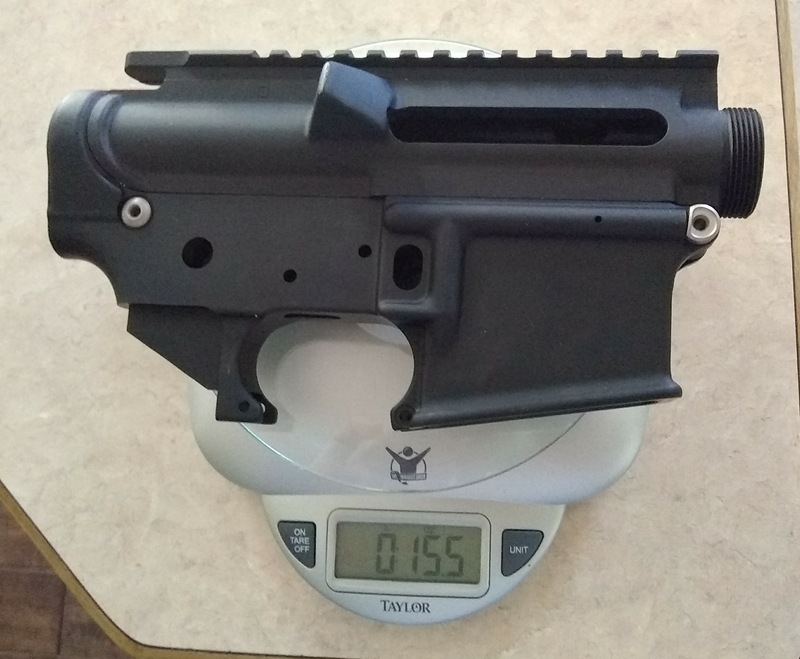 With a scope and a full magazine, I anticipate a total weight of about 6 lb 13 oz, and a total length of about 32 inches. When the RC1 is complete, I will assess the performance of this weapon in a future post. I’ll provide a link here to make it easy on you.